W705 can be spelled out as the first generation Walkman phone that Sony Ericsson has WiFi facilities. Even enthusiasm, Japanese-Swedish vendor is to complete a variety of powerful features to the phone so the main sponsor MTV Europe Music Awards 2008. Taking the concept a little corner of the slide, the W705 choose the model and more like a flat G705. Sliding mechanism that is applied to the W705 feels fine and smooth, solid construction bearable. Compare the property with the W910 and W580, which does not feel solid. This is one of improvement, which continues to be Sony Ericsson. When the position of the slide is closed, only decorated the front panel soft key and the key D-pad, which also functions as a double key music player. While the top there is a light sensor and camera for video call, the position earpiece flank. Now move to one side, namely the structure keypad. G705 models that also have similar effects on the flat expanse of rubber keypad with smooth model that is not much different. Which is less comfortable texture that gives the rest of the little hollow between the keys, make feel less comfortable when be touched. However, access remains a matter of convenience with both guaranteed. Not a secret anymore if the phone is always to offer premium-class perfection in all lines, including for the screen. Although only in the W705 has a resolution 18 bit color or 262,144, but transflektif technology in the mobile phone able to feel the luxury. However, the level of clarity and contrast are still dimmed even less impressed when dealing okay with the sun. This is one of the lack of this type of screen. W705 is also using the new software interface. Automatic, the phone is similar to several previous Walkman series, such as the W595 and W980. Structure of the standard model and the cool special themes generation Walkman phone is very good. Moreover, the effect with flash lite are presented with can be returned. 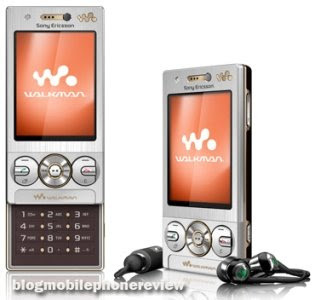 Various Sony Ericsson's innovation was to upgrade the performance are presented Walkman player. Stereo Widening are called to present the features and capabilities SensMe Shake control to change the song track, with just swing the phone. All can be found in the Sony Ericsson W705. But to effect such MegaBass property owned W705 not W595. Matter of performance and audio player, need not asked again. However, to get the maximum performance of the new can be felt when using the headset from the W705. Because, if on the loudspeaker that the position is at the base to the back of the body, the audio output is flat out. In fact, still quite strong compared to the loudspeaker of the mobile phone belonging to China. The presence of female converter jack 3.5 mm, can be used to create the feel of the music is terrible again. For example, the Sony Ericsson W705 is a player for home theater. For class PDA phone or Smartphone, the presence of WiFi connection is normal. But, what if this means there is a music phone Sony Ericsson W705? Of course, a performance. In fact, Sony Ericsson W705 claimed as the first music phone that has WiFi technology supports 802.11 b / g.
Performance in the trawl Internet hotspot respited be calculated, the same as G705. That, the presence of these blessings that you make the hobby of browsing in a place with a lot of free hotspot point, to enjoy the virtual world for free. For an alternative connection, the phone is also set up Bluetooth and cable data typical Sony Ericsson. Thus, the process of exchanging files easily and smoothly. This phone also has data access technologies to support high-speed generation of HSPA (High Speed Packet Access), the UMTS (Universal Mobile Telecommunications System). Matter of speed and stability are still strong, if less than W595, which has HSDPA support. However, to enjoy the 3G services offered such as video call and video streaming network is size able enough. Like other types, to explore the virtual world affairs Sony Ericsson using NetFront 3.4 browser. Both web and wap format equally be executed well and smoothly. Moreover, W705 also has the ability puls auto rotate the screen mini-map, which can be used to increase the comfort of browsing the Internet. Resolution camera Sony Ericsson W705 is a 3.2 megapixel. Ability still camera for the average middle-class Sony Ericsson. Additional facilities have been fully sizable, even interface the camera viewfinder and the model mimics the concept of Cyber-Shot, but if the performance of this generation than Sony Ericsson W705 camera has not been up to. Lights flash and the presence of some standard settings such as shooting mode and night mode, can be relied upon. However, the W705 camera is not supported autofocus capability. This camera can also make a film clip in mp4 format. Recording the results still feel less smooth and the resulting picture does not seem fine. Such as G502, W980, T700, W595 and some of the latest series, Sony Ericsson W705 will also have applications in the Google Maps feature Location Services. With this application you can monitor the location via a special digital map. Even if the GPS receiver connected to a digital map of the internet this can be used to guide care. The many features that this phone should be taken with resources offset the power prime. Luckily, for the accommodation they use W705 Battery Lithium Polymer 100 mAh. Concerning the performance of music in this latest generation Walkman that does not need to doubt. On the other hand, the presence of WiFi connection and the 3G network could be an additional attraction to bait consumers. However, less than the maximum performance of some of the main features such as camera and the selling price be calculated high enough, should also be considered. Because, there are several other vendors who offer the type W705 classmates with the ability that is not much different, but with a cheaper price.